The Belmont Food Collaborative’s mission includes our Food Assistance program: providing access to fresh, local food through matching government benefits at the Belmont Farmers' Market, and by supporting community organizations with similar goals. Can you help? Your donations support these and other programs. Matching SNAP dollars The Collaborative matches shopper SNAP dollars at the Belmont Farmers’ Market, up to $20 each Market day per shopper. SNAP is the Supplemental Nutrition Assistance Program (formerly the Food Stamp program). The table shows the total amount that shoppers spent (their amount plus our match). Shoppers have told us how important that extra money is. Each week, it lets them put fresh, local produce on their tables. Read more about matching SNAP and other benefits at the Market. WIC and Senior FMNP coupons Take your WIC (Women, Infants and Children) and Senior FMNP (Farmers’ Market Nutritional Program) coupons to our vendors for any appropriate products. They will match the amount on the coupon, letting you spend twice the face value. We reimburse them for the match as part of our food assistance program. Community growing We have grown hundreds of pounds of vegetables for the Belmont Food Pantry in past summers. 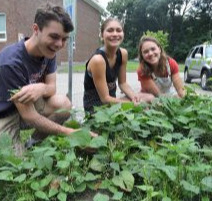 The project started in someone’s front yard (2012), added raised beds at Belmont’s Beth El Temple Center (2013), beds at Belmont High School (2014), and beds at Rock Meadow (2015). We have changed the program to be an educational one: Our garden at Rock Meadow is used to teach families how to raise their own produce. Boston Area Gleaners Volunteers glean fields after farmers finish their harvesting, which saves good produce from being plowed under. 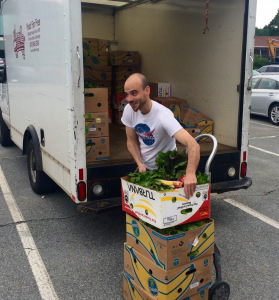 We defray the cost of deliveries by Boston Area Gleaners (BAG) with donations of $5 per 30 lb. box of produce delivered; that added up to $1,413 in 2015. They also collect unharvested food from local farms and work with other farmers’ markets, shelters, farms and other organizations in Eastern Massachusetts. Food For Free At the end of each Market day, vendors can donate unsold produce and baked goods to Food for Free. Their volunteers collect the food and take it to local food pantries, meal programs and shelters in the greater Boston area. The numbers went down in 2016, probably due to the drought and the lack of stone fruit (peaches, plums, etc) because of weird weather in the winter. Belmont Food Pantry donations Shoppers bring non-perishable items to the Belmont Farmers’ Market. We also buy eggs to donate to the Food Pantry, and in 2016 we donated 120 half-dozen cartons of eggs. Healthy Incentives Program (HIP) SNAP recipients get free produce when they buy directly from farmers. Get more information on the Belmont Farmers' Market website, or from the Commonwealth of Massachusetts website.